Pencil, charcoal and black chalk on paper, 454 x 357 mm. 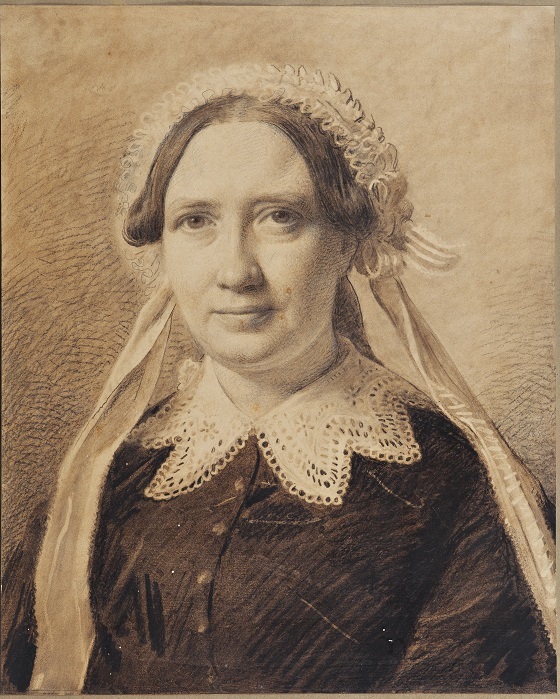 The same year Constantin Hansen painted a portrait of the enterprising merchant Alfred Hage, he also completed this portrait of Hage’s wife, Frederikke Vilhelmine, who was also mother to their son Johannes. Unlike Alfred’s portrait, Frederikke is depicted frontally with a warm and welcoming expression, looking straight at the viewer. The unpretentious and lifelike expression of the painting is reflected in bonnet’s loose ribbons playfully and elegantly falling down over the black dress and finely embroidered collar. The portrait was in all likelihood commissioned by her devoted spouse, who also employed Hansen to work on a number of other works, including the famous group portrait The Constitutional National Assembly from 1864, which today can be seen at the Museum of National History in Frederiksborg Castle. Constantin Hansen received his initial training from his father, Heinrich Hansen, who was a portrait painter. Later, he studied under C.W. Eckersberg and his paintings became more classical in composition with tight, symmetrical structuring. Constantin Hansen was an excellent colourist and in many of his sketches, he anticipated the colour handling and painterly technique of the Impressionists. In 1860-64, he carried out the huge painting The Danish Constitutional Assembly, which now hangs at Frederiksborg Museum. The painting was commissioned by Johannes Hage’s father, Alfred Hage, and hung in the dining room at the family’s home in Harsdorff’s Palace on Kongens Nytorv (no. 3, the white palace to the right of Charlottenborg).